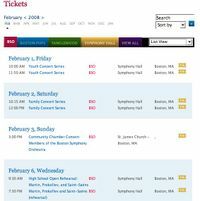 Rich Bradway, Associate Director of E-Commerce and New Media for the Boston Symphony, and I spoke the other day about the BSO’s strategies for the web. What’s the goal? First Things First. I’m so interested in exploring social media and web 2.0 and for me it’s a really good reminder that first things come first. One of the first goals is to enhance the user experience, and make things as easy as possible. There is no point in making all sorts of content and connections out on the web only to have people struggle to get around and find what they want when they land back at your site. For the BSO, on the most fundamental level, one way to accomplish this has been to find ways to make navigation simpler and reduce the number of clicks and pages that have to be refreshed. 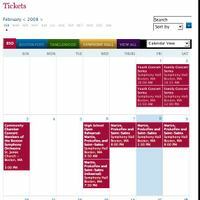 Using web 2.0 technologies like those that underlay tools like Google calendars and maps, they rebuilt their calendars so that that they automatically refresh content without having to reload pages. This is really important for the BSO because they have 4 brands and hundreds of events to manage. Their new rebuild allows a visitor to see any of the events for any of the brands with just one click. Similarly, they wanted to keep a calendar on every page, wanted a small foot-print and also to maintain functionality. Now with their horizontal calendar anyone can easily see a month out and every event with one click. The goal: It helps people get to what they want more quickly. 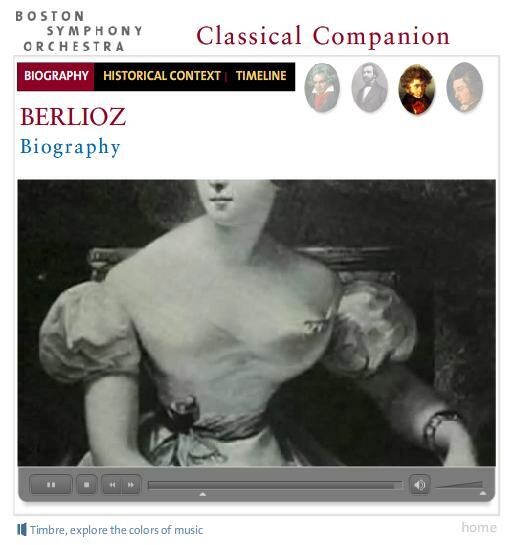 The BSO is changing how it presents its interactive and educational content. They are converting their “Online Conservatory” to something more accessible and versatile called Classical Companion. The Online Conservatory was an in-depth look at just a few programs from the season, with all the content combined together in a way that limited its ability to be used for other purposes. Now each small piece of content is being created as separate flash modules that can be used more frequently and in varying contexts. Rich notes that “we have the ability to showcase many more programs, or composers, or music being performed.” Something that could be dropped in and not its own separate website. Starting last fall with their Carter program, and continuing with other concerts like their Family concerts, they are creating small modules showcasing each of the composers and including kid friendly interactive modules with quizzes, and timelines with certain milestones in a composer’s life or other important dates in history. Another basic module will be called Timbre – and it explores the ‘colors’ of music and how you can orchestrate or arrange a piece of music to create or change that timbre. The long-term goal is to build an interface independent of the programs so content can be used anywhere on the site. Direct link between podcasts and increased ticket sales. Last year the BSO started producing podcasts that were concert previews for the BSO season. “We tried to create a slimmed down version of our pre-concert lectures that we could extend through the Internet and allow people to subscribe to. Over the course of time, while the audio portion is still trying to be a snap shot of the pre-concert lecture, these podcasts are getting longer and with more ancillary content. People started asking for the program notes at the same time, so now we also pass in the program notes at the same time as the podcast. We try to supplement with other content. For example when we did Daphne and Chloe, we were able to put up some footage of a concert we did in 1967, and getting our toes wet in doing video podcasts” says Rich. WGBH had some great features and interviews that they were unable to reuse and were happy to provide to the BSO for the podcasts. So here is the amazing thing…. 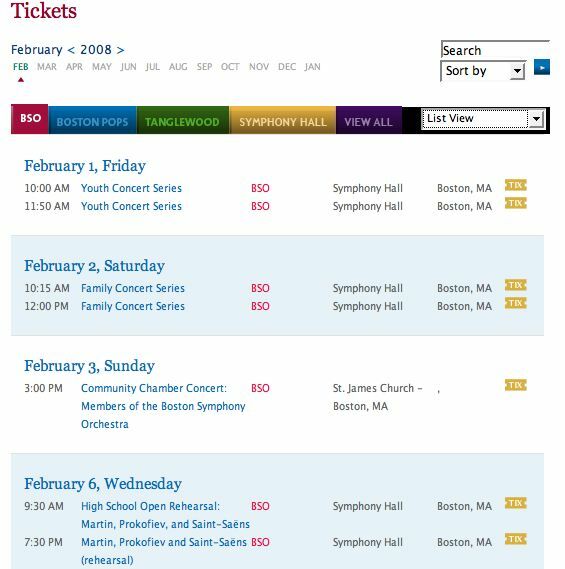 Every year online BSO ticket sales tend to go up 10-12 % each year, and that was the only thing that they really did differently. This year they are continuing with excellent results. The current challenge is to be balanced with the right amount of content without overdoing it. At the same time keeping the content compelling with each item supportive of the next. So Podcasts are an important part of their business now. There are over 75,000 people subscribing to their podcasts, of which about 40,000 are regular down-loaders - (either every week or every other week). Considering how many people come to the BSO during any given week, this seems like a huge following. The podcasts were originally designed to augment the concert experience, and make the experience more enriching for those already planning to attend. They thought it might be helpful to those ‘on the fence’. This is part 1 of a 2 part series. Part 2 tomorrow.